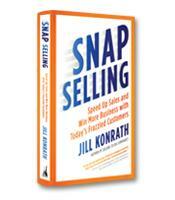 In SNAP Selling, Jill Konrath alerts us to the fact that we are on the edge of a new age in selling — it’s no longer a numbers game. Today, you actually will be more successful if you make fewer calls, meetings and presentations. In this summary, Konrath offers four SNAP rules to win more sales, and she teaches us that sales is an outcome not a goal. How to make things easy and clear for your customers. How to stand out by being the person your customers can't live without. How to make sure you're in sync with your customers' objectives, issues and needs. How to keep the most important decisions at the forefront of their mind. How to differentiate yourself from your competitors and speed up the decision-making process.